Nydia Velazquez was born in Yabucoa, Puerto Rico on March 22, 1953. She earned a BA in political science from the University of Puerto Rico in 1974, and an MA in in political science from New York University in 1976. She was a professor at the University of Puerto Rico’s Humacao branch from 1976–81, and at New York’s Hunter College from 1981–83. In November 1992 Velazquez narrowly won election to Congress as a Democratic representative of the carefully gerrymandered 12th District of New York, which had been formed earlier that year by linking together Hispanic neighborhoods in Brooklyn, Queens, and Manhattan’s lower East Side. The overall population of the district was 49% Hispanic, 16% Asian, and 9% African-American. During the campaign, Velazquez’s medical records, which indicated that she suffered from clinical depression and had once attempted suicide, were leaked to the media. She quickly held a press conference and explained that she had been undergoing counseling for years and was now psychologically healthy. Endorsements from then-mayor David Dinkins and civil-rights activist Jesse Jackson were key to Velazquez’s victory. The first Puerto Rican woman elected to the U.S. House of Representatives, Velazquez became a member of the Congressional Progressive Caucus. In 1999 she joined fellow Democratic Representatives Luis Gutierrez, Jose Serrano, and Ron Dellums, as well as former New York City Mayor David Dinkins, in exhorting President Bill Clinton and Deputy Attorney General Eric Holder to grant clemency to 16 incarcerated FALN terrorists — Puerto Rican Marxist-Leninists whom Velazquez and her cohorts characterized as “political prisoners.” When Clinton offered clemency only to those who would agree to renounce the use of violence, Velazquez criticized the president for not making his clemency offer unconditional. 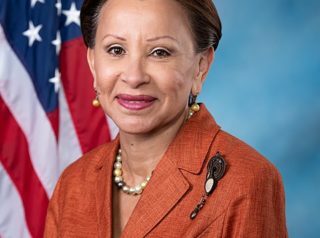 Though she is a Roman Catholic, Velazquez in 2015 voted against the “Born-Alive Abortion Survivors Protection Act,” which provided that if an infant somehow survived an abortion procedure, it would acquire the human rights of a person already born. From 1995-2003, she voted eight times against legislation designed to ban the procedure commonly known as partial-birth abortion. As a result of her unwavering support for the unrestricted right to taxpayer-funded abortion-on-demand, Velazquez has consistently received ratings of 100% from NARAL and Planned Parenthood. On multiple occasions, the Democratic Socialists of America (DSA) have endorsed Velazquez’s political campaigns. In June 1993 Velazquez sent personal greetings to those attending the DSA’s annual Eugene Debs/Norman Thomas/Michael Harrington dinner banquet, named in honor of three prominent American socialists. In October 1995 at Harlem’s Abyssinian Baptist Church, Velazquez attended a standing-room-only gathering to give a hero’s welcome to Cuban dictator Fidel Castro, who was visiting New York. Three years later she supported the Cuban Humanitarian Trade Act, which sought to ease restrictions on U.S. commerce with Cuba. A strong opponent of America’s military intervention in Iraq, Velazquez in 2005 joined the Out of Iraq Congressional Caucus. She was subsequently listed as an endorser of a January 27, 2007 “Act Now to End the War” event organized by United for Peace & Justice. Other endorsers included the Committees of Correspondence for Democracy & Socialism, the Communist Party USA, the Democratic Socialists of America, the National Lawyers Guild, the National Organization for Women, and the Socialist Party USA. In August 2008, Barack Obama‘s presidential campaign named Velazquez as a member of its National Latino Advisory Council, along with such notables as Raul Grijalva, Luis Gutierrez, Eliseo Medina, Linda Sanchez, and Hilda Solis. For an overview of Velazquez’s voting record on numerous key issues, click here. Further Reading: “Nydia Velazquez” (Votesmart.org, Keywiki.org); “Candidate Faces Issue Of Suicide” (NY Times, 10-10-1992); “Nydia Velázquez’s Voting Records on Abortion” (Votesmart.org); “Nydia Velazquez Denounces Courthouse Arrest of Illegal Immigrant Facing Domestic Violence Charges” (Daily Caller, 4-7-2018); “Rep. Velazquez Says Men Shouldn’t Decide Abortion Policy …” (Daily Caller, 7-9-2018); Nydia Velazquez’s Positions on Key issues (OnTheIssues.org).